If you’ve never taken part in a cookie exchange before, let me recommend this enjoyable way to share the holiday spirit. And it’s not too late in the season to organize one. I don’t remember where I first heard about cookie exchanges or cookie swaps, but I do know that the idea immediately struck me as a winner: Bake one batch of cookies, get together with a group of friends, and divvy up the cookies. Go in with snickerdoodles, come out with chocolate chip, peanut blossoms, rugelach, Mexican wedding cakes and more, depending on the group. I enlisted my officemates to try it out, and it worked so well that we started a December tradition. Not only was it fun, it was efficient and saved buckets of time when everyone was being pulled in several directions at the holidays. This year found me swapping with another group of friends, who were also pleased with the results. 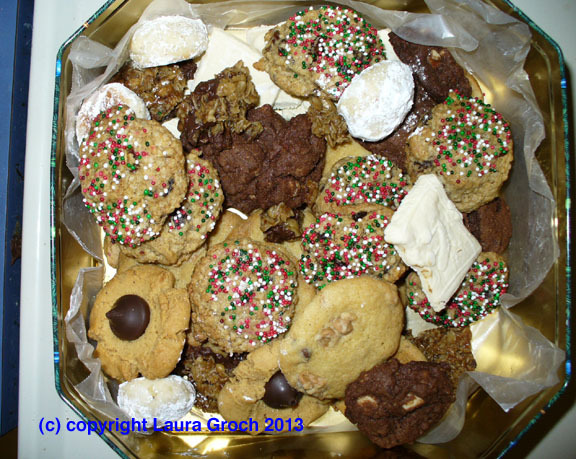 As I said, it’s not too late for you to enjoy the fun, creativity and rewards of doing a cookie exchange. 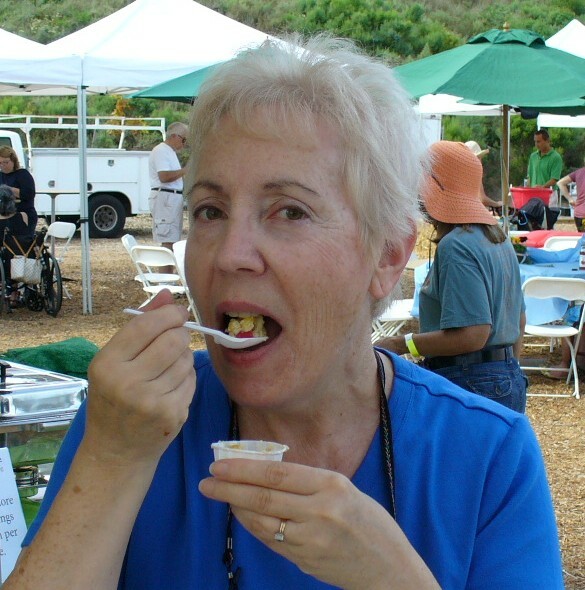 (How about organizing one for a Saturday-or-Sunday-before-New-Year’s get-together!) All you need are 1) a batch of homemade cookies; 2) a few friends, relatives or colleagues (make sure one of you is good at math! ); 3) about 90 minutes to make the exchange in whatever place you designate; and 4) an extra container to put your shared cookies into while others are taking from your batch. The basic idea is to divide the cookies by the number of bakers, then each one takes that number of cookies from everyone else. So if you have 6 people, you bake, say, 4 dozen cookies (48). Forty-eight is evenly divisible by 6 (6 x 8 = 48). Everyone keeps 8 of his or her own cookies, takes 8 from everyone else’s batch, and you go home with 48 cookies, the same number you brought in, except you now have six different kinds. We used to have as many as a dozen people, and we’d each bake as many as 6 dozen cookies (also a nicely divisible number). Something always happens, though. One person always bakes more, another bakes fewer — recipes are variable, after all, and so is the human hand. But someone else always manages to figure it all out to everyone’s satisfaction. The cookies don’t have to be fancy — not at all. Of course, if your specialty is an elaborately decorated cookie, go for it. Just don’t be disappointed that others can’t match your baking prowess. Remember, they’re all still tasty cookies! The one big rule is that the cookies must be homemade. It’s not fair to those who actually made dough and shaped and decorated it (or even just dropped spoonfuls onto a cookie sheet). They put effort into their cookies, no matter how simple (or blobby). It’s just not right to hand over a machine-made cookie in exchange for an individually made little work of art. And they are all works of art, I can assure you, from the humble oatmeal cookie to the sophisticated palmier. The sight of them arrayed on a plate will gladden your heart as much as anything by Picasso or Renoir or Wyeth. Or Norman Rockwell, for that matter. Bringing together different people and traditions and recipes to share them with each other is about as American as it gets, in my view — and it also reflects the spirit of the season. Really, there’s no good reason why the Christmas/Chanukah/Kwanzaa time of year should hold a monopoly on pretty cookies. In fact, we’re already planning a Valentine’s Day cookie exchange. 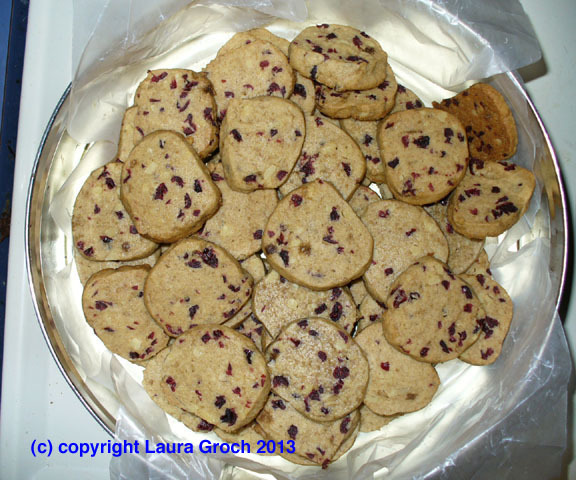 I made this refrigerator cookie for our recent cookie swap, but used cranberries this time instead of apricots. It’s from “Gifts From Your Kitchen,” by Better Homes and Gardens (Meredith, 1976). Cream together butter and brown sugar till light. Blend in egg and almond extract. Stir together flour, baking powder and salt; stir into creamed mixture. Stir in apricots and nuts. Shape into two rolls 1 1/2 inches in diameter. Wrap in waxed paper. Chill well. Cut in 1/4-inch slices; place on ungreased baking sheet. Bake at 350 degrees for about 10 minutes. Makes 6 1/2 dozen. Notes: I used butter, not margarine, and about 1/4 cup of nuts (I used walnuts) instead of 1/2 cup. A knife will do to chop dried apricots, but I used kitchen shears to chop the cranberries.